It’s back! Free Street Theater’s Performance for Direct Action and Intervention training is a 16-hour training that helps artists and organizers plan creative direct actions. From the history of protest performance, to planning an action, to the aesthetics of scale and space, this 2 day intensive is designed to offer participants practical skills and room to invent. 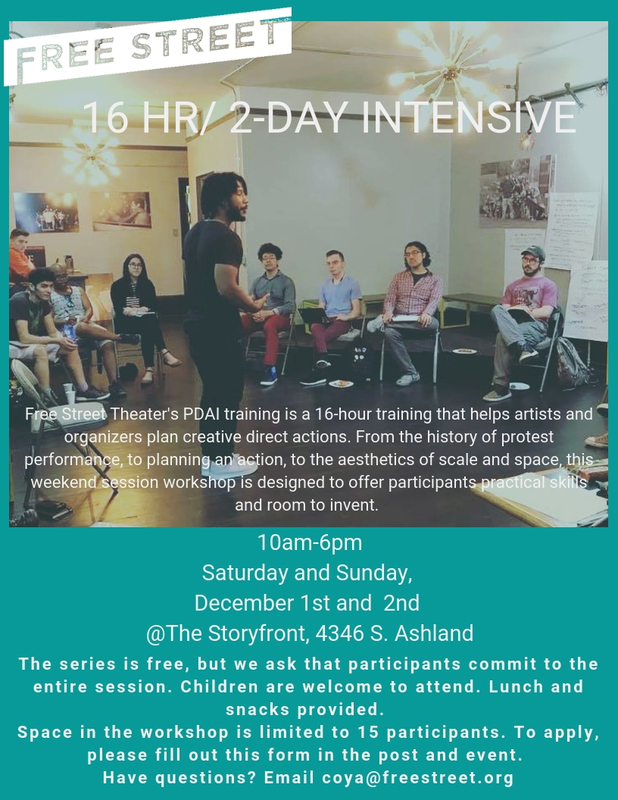 This is a two-day intensive offered from 10-6 on December 1st and 2nd at our Storyfront (Back of the Yards) location. The workshop is free, but we ask that participants commit to both days. Lunch and snacks will be provided, and children are welcome to attend. Since 1969, Free Street has been committed to making performance by, for, with, about, and in Chicago’s diverse communities and to using theater to build solidarity in the face of segregation. We do not endorse political candidates, platforms, or strategies. We provide training on performance skills, and encourage people to apply critical thinking strategies to their own lives and problems in order to invent the solutions that best suit their community’s needs.